Interview by Michael Gipson, Art Education student at Arizona State University, researching visual culture issues. A self-published publication. Whatever content the publisher/editor wants to include is freely and totally up to them. 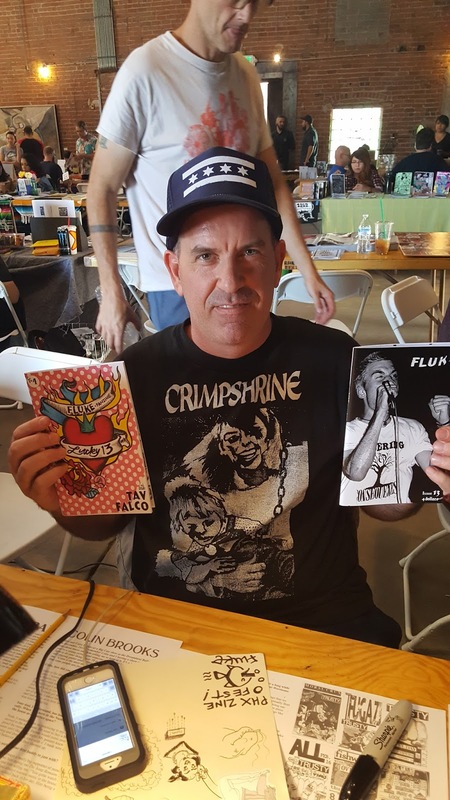 Fluke is a punk fanzine. It usually features interviews with bands and artists and has photographs, writings, personal stories, art and other ideas. What are the most important elements of a good zine? Content. I like to include stuff that hopefully inspires people. I like for it to be visually appealing. Affordability is good. Zines should be accessible to common folk. If it's more than five bucks that's probably too much for it to be called a zine, in my mind. Why do you make your zine? I make it because it's a creative outlet. It keeps me connected to creative people. I have things that I would like to share, and it's a part of giving back to the punk community that gave so much to me. How do you define success for your zine? The quality of the finished product, the sales numbers, and positive responses from peers. Really it's about how I feel about it, the way that it looks, the content, and obviously the reception. Can you talk a bit about your process? Usually it begins with a single idea. A single interview or idea and then it kind of builds from there. I usually have bits and pieces from a lot of contributors. I have a lot of friends who do really cool stuff so a lot of what Fluke is about is really about my friends. I just kind of pull everything together and see what sticks. The cool thing about doing the zine is I never really know the end result. The magazine always seems to create itself. The end product is usually nowhere near what i thought it would be in the beginning. It kind of has a mind of its own. It's always been primarily cut-and-paste, like in the copy shop. This new issue that I did, a friend of mine named Joey Cadre helped with the layout and design. I'm really happy with the way it turned out. It's a combination of cut-and-paste and computer graphics. Computer layout, I should say. What specific target audience is your zine trying to find? Mostly punk culture, but it's intended for anyone who wants to read it. Where can your zine be found? Around town in Phoenix and Tempe area, I have it in independent shops like Stinkweeds, Revolver Records, Double Nickels Collective, Zia Records, Ash Avenue Comics. Also, Wasted Ink Zine Distro carries Fluke, as do independent record stores and bookstores around the country. Also, it's distributed by Last Gasp of San Francisco and Microcosm Publishing. A lot of people think that the only work involved in doing a zine is making the zine itself, but getting it out there is the other side of that, which I really enjoy doing. It's still a huge job once the magazine's finished and in your hands. It's a lot of work to get it out there across the country. Does your zine have an online presence? I have a Big Cartel page: fluke.bigcartel.com, where you can purchase back issues and my current issue. I have a blog: flukezine.blogspot.com and there's an Instagram: fluke_fanzine. Facebook. Just do an online search and all kinds of stuff pops up. Do you feel like there's a sense of community amongst those who make zines? Yeah, for sure there is. There's a certain type of person who does zines and it's usually not your typical mainstream type of person. There's definitely a common bond there I think. Why do you think zines are an important art form? Because it's the voice of the people. It's the voice of those who may not have had a voice in any other arena.